My apologies for the short absence as I was away on vacation with the family in Fort Myers. 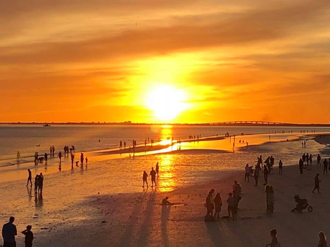 We were able to take in a barnburner 1-0 Rays win over the Jays on June 13, as well as this gorgeous sunset on Fort Myers Beach the evening before we left. Besides the sweltering humidity, constant mosquitos, torrential rains every afternoon and incredibly poor drivers all over the road, the vacation was just what the doctor ordered. The sun also appears to be setting on Shohei Ohtani's amazing 2018 season as well. We got the depressing news that he now has a grade 2 UCL sprain and that the Angels tried Platelet Rich Plasma injections. They will then evaluate things in a few weeks before deciding whether the he needs Tommy John surgery. Whether you own shares of him or not, the news is terrible. I do not have him in any of my leagues, but it has been fun to watch him pitch when he is dominating a lineup, and I even got to see him hit a home run in person in May. If you do own him, you are upset and wondering what to do with him. In a reset league, I am pessimistic he will have any value the rest of this season.